There is growing consensus about the vital role that the private sector does, can and should play in development and ending poverty. The idea of sustainable business ­– going beyond social responsibility to strike a different balance between the goals of profit and social return ­– has been a new source of energy in the post-2015 discussion. This week we explore the role of the private sector in ending poverty, raising questions about what it is contributing now and how that could be enhanced for greater impact. So, why is the private sector at the heart of the discussions? The private sector has emerged as a key player in the global financial landscape affecting developing countries. 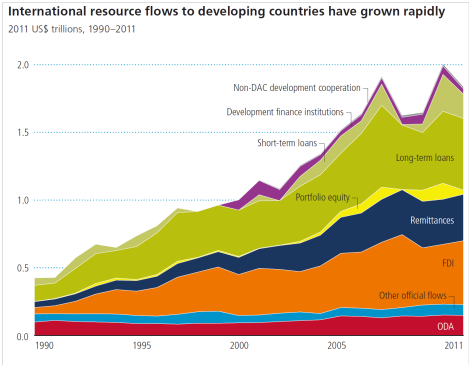 In the early 1990s aid was the largest international resource flow to 95 developing countries; now it is the largest for 43. Growth in private flows has driven this change. Foreign direct investment (FDI) in developing countries grew from under US$50 billion in the early 1990s to almost half a trillion in 2011. At the same time, remittances and commercial lending grew to US$343 billion and US$516 billion. Emerging markets are gaining prominence on the global stage and FDI in developing countries exceeded FDI in developed countries for the first time last year. And countries with their own development challenges, like China, India and Brazil, are making major commercial investments in Africa and elsewhere. See Using all resources available to end poverty: What you need to know. But this pattern doesn’t apply everywhere. There are still a large number of developing countries that receive very little private investment and are held back from developing sectors like transport, energy and communications. Alongside the large private resource flows to developing countries, large volumes of resources also leave developing countries. In 2011, $472 billion of FDI was reported as flowing into developing countries ­– and $420 billion was reported as flowing out. Some of these outflows are productive investments in the rest of the world, such as in infrastructure. Others are repayments on debt, repatriated profits or capital flight. The true value of resources is in the way they are used. 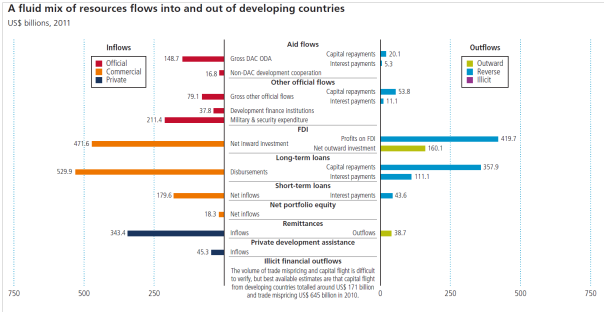 Outflows aren’t necessarily detrimental to developing countries but, for instance, FDI’s potential to contribute to development may be affected by how far profits are repatriated rather than being reinvested locally and where taxes are paid. What does this mean for ending poverty? This means that the context in which we plan to end poverty is very different from the way it looked a decade ago. The scale and nature of the private sector in many developing countries suggests massive potential to harness the power and dynamism of the market to scale-up the resources and opportunities available to people living in extreme poverty. The question then becomes, how can these rapidly growing business investments link up with other resources (domestic and international) to reach the poorest parts of the population? Everyone thinks that jobs are important, but what sort of jobs? How can business activities respond to populations whose livelihoods depend on casual labour, migration, subsistence and – all too often – hazardous and insecure work? What comparative advantage does the private sector have in ending poverty – alongside other resources? Private business offers a different model to aid and public resources. The private sector can provide jobs, goods and services for some parts of the population much more effectively than can governments or aid agencies. It can also work at a much larger scale, enabling investments in transport and energy infrastructure, which deliver important longer-term benefits to an economy and often public goods that very many people can take advantage of. But how does business work in a way that spreads these benefits throughout the population – to reach women as well as men, to make better use of the energy which poor people are already investing in their own development – but often with a very low rate of return? Our blog tomorrow focuses on the specific ways in which different private sector resource flows can be used for social good and to end poverty in different countries. If business, government and private resources are used together, can we achieve more progress ­– and how does that happen? The Global Partnership for Effective Development Cooperation, and the upcoming high level meeting in Mexico in April 2014, offers the private sector an important opportunity to explore the ways in which it can contribute towards ending poverty, and will play a critical role in moving this agenda forward.